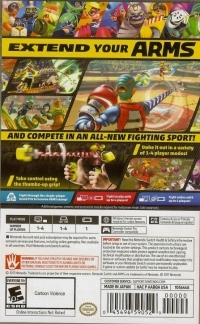 AND COMPETE IN AN ALL-NEW FIGHTING SPORT! / Duke it out in a variety of 1-4 player modes! / Take control using the thumbs-up grip! 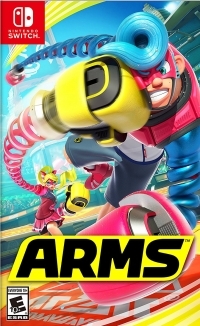 -Fight through the single-player Grand Prix to become ARMS champ! -Fight locally with up to 4 players! -Fight online with up to 4 players! 06-16-2017 aliensstudios Box Text EXTEND YOUR ARMS AND COMPETE IN AN ALL-NEW FIGHTING SPORT! / Duke it out in a variety of 1-4 player modes! / Take control using the thumbs-up grip! 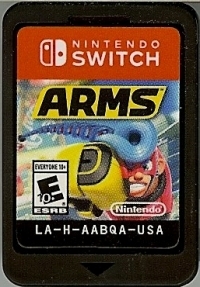 -Fight through the single-player Grand Prix to become ARMS champ! -Fight locally with up to 4 players! -Fight online with up to 4 players! This is a list of VGCollect users who have ARMS in their Collection. This is a list of VGCollect users who have ARMS in their Sell List. This is a list of VGCollect users who have ARMS in their Wish List.